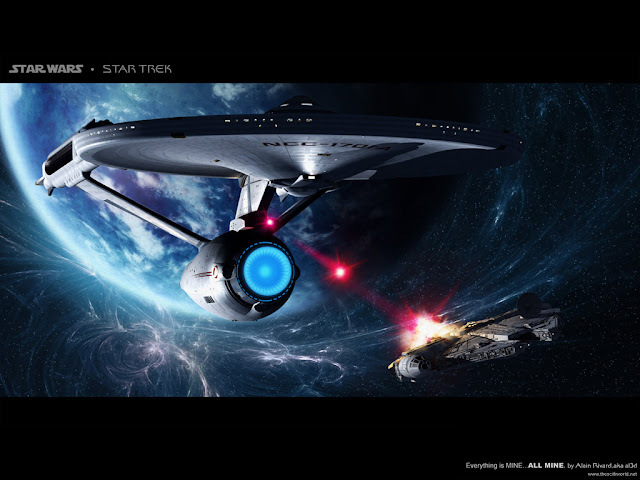 I became infuriated recently after seeing a clip of professional Mythbuster and nerd king Adam Savage responding–amidst many others–to the question “Who would win in a fight: the Millennium Falcon or the starship Enterprise?” I wasn’t particularly upset by his answer; at face value the Enterprise is certainly a more strategically capable vessel. What bothered me was Savage’s scoffing at the question. Yes, the question seems meaningless even among nerds who accept that the ships work on entirely different technologies, scales, and aren’t even in the same class of vehicle. But Adam was so dismissive about the question from the “numbers involved” that it seemed ridiculous to bother investigating. Sir, that is precisely the bread and butter you spread up it. So I began researching. I started jotting down particular specs and methods by which to equate them. I’m surprised but not even embarrassed by how much data I was able to pull just from my personal bookshelf. The greatest difficulty in this matter is in fact the truth that the Millennium Falcon is a (highly modified) light freighter, and the Enterprise is a military flagship. It would make more sense to compare the Enterprise to, say, a Star Destroyer than a small shipping vessel. Labels: Adam Save, enterprise, Imperial II, millennium falcon, Mythbusters, ncc-1701, ncc-1701-d, phasers, star destroyer, star trek, Star Wars, torpedo, vs.
How 'Big' is the 'Game of Thrones' World? Let me be clear: I am in no way questioning the size of its fanbase or the sprawling narrative that is A Song of Ice and Fire." I am not the type of nerd to belittle any particular fandom or its accomplishments, even those to which I don't personally belong. No, I'm the type of nerd who needs to functionally quantify how those worlds work until I am either sufficiently assuaged or beaten by those next to me into a light coma. 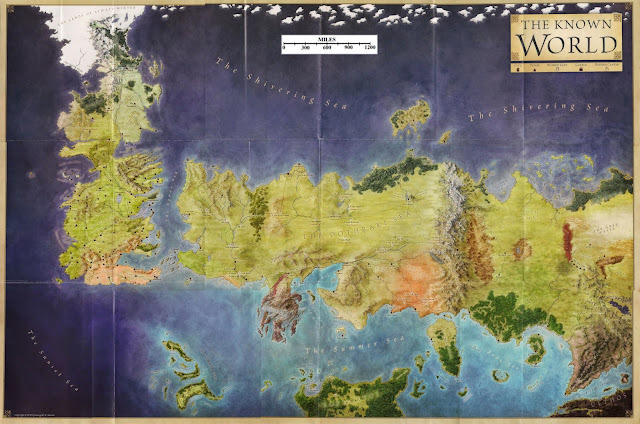 When I ask, "How big is the Game of Thrones world?" I'm asking if the continents we've seen make up the bulk or simply a small fraction of their world's landmasses. I'm asking if, like James Cameron's Pandora, the planet is physically smaller than Earth and–having a potentially lower mass–the gravity is weak enough to allow large reptiles to grow in an oxygen-rich atmosphere and ascend to the skies on leathery wings. Does rain fall less forcefully? Are the blows from the executioner's blade less powerful? How high would Ned Stark's skull bounce? More pressing, narratively, is there an entire world of events happening outside the scope of this franchise waiting to be mined for ideas? Other civilizations at different technological levels inhabiting the same celestial sphere?